This 1942 photo taken at the Santa Anita Racetrack’s “horse car spur” shows Pacific Electric cars nos. 1370, 1226, and 1237. The train had just arrived from 6th and Main Street Station. Shortly after the bombing of Pearl Harbor on December 7, 1941 by the Japanese, President Roosevelt signed Executive Order no. 9066 in February. 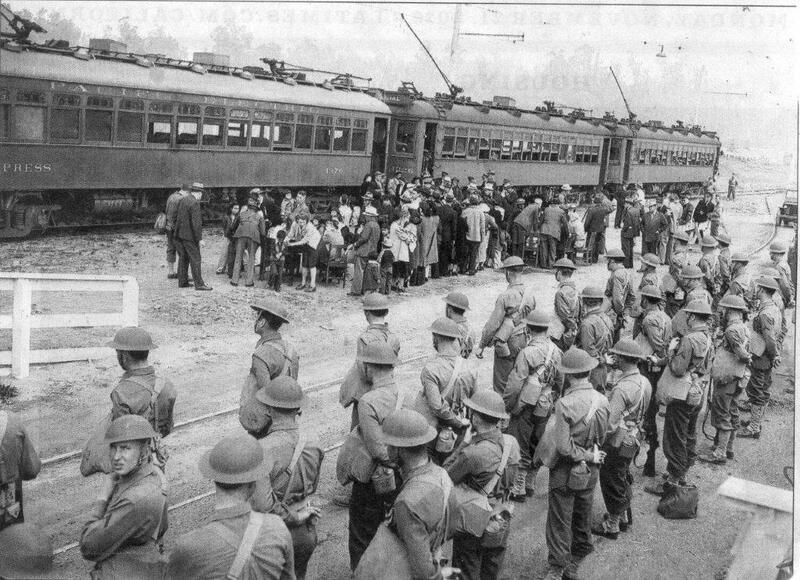 When that order was sighed, thousands of Japanese Americans were “rounded up” along the West Coast of California. Many of them were taken to PE’s 6th and Main Street Station where they boarded 3-car trains for a short trip to the Santa Anita Racetrack. At the track, temporary shelter was provided until they could be registered and identified. 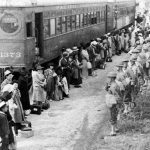 From here, they boarded an armada of buses — the majority, PE WHITE Motors model 798s — for the long trip to the Manzanar relocation camp to sit out the remainder of World War II. The use of PE interurbans and buses for this purpose, was not one of the finest moments in PE’s 50-year history. But World War II did provide the PE with some of its finest hours in that same 50-year history. Southern California would have been up the proverbial “creek without a paddle” had it not been for the PE and LARY’s vast rail and bus system. It was public transit’s finest hour, never to be repeated after the war ended. 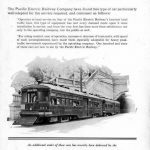 The PE started to “modernize” it rail cars and buses in 1939. The “Butterfly 12’s” and Hollywood cars were modernized early on, but notice in this 1942 photo, none of the 3 cars shown here have gone through Torrance Shops yet, no electric markers of butterfly paint trim. The trailing car is a Portland combine, number 1376.